Since I’m a big fan of the Laffer Curve, I’m always interested in real-world examples showing good results when governments reduce marginal tax rates on productive activity. Heck, I’m equally interested in real-world results when governments do the wrong thing and increase tax burdens on work, saving, investment, and entrepreneurship (and, sadly, these examples are more common). My goal, to be sure, isn’t to maximize revenue for politicians. Instead, I prefer the growth-maximizing point on the Laffer Curve. In any event, my modest hope is that politicians will learn that higher tax rates lead to less taxable income. Whether taxable income falls by a lot or a little obviously depends on the specific circumstance. But in either case, I want policy makers to understand that there are negative economic effects. Writing for Forbes, Jeremy Scott of Tax Notes analyzes the supply-side policies of Israel’s Benjamin Netanyahu. Netanyahu…argued that the Laffer curve worked, and that his 2003 tax cuts had transformed Israel into a market economy and an engine of growth. …He pushed through controversial reforms… The top individual tax rate was cut from 64 percent to 44 percent, while corporate taxes were slashed from 36 percent to 18 percent. …Netanyahu credits these reforms for making Israel’s high-tech boom of the last few years possible. …tax receipts did rise after Netanyahu’s tax cuts. In fact, they were sharply higher in 2007 than in 2003, before falling for several years because of the global recession. …His tax cuts did pay for themselves. And he has transformed Israel into more of a market economy…In fact, the prime minister recently announced plans for more cuts to taxes, this time to the VAT and corporate levies. Though I have to say that rising revenues doesn’t necessarily mean that the tax cuts were completely self-financing. To answer that question, you have to know what would have happened in the absence of the tax cut. And since that information never will be available, all we can do is speculate. That being said, I have no doubt there was a strong Laffer Curve response in Israel. Simply stated, dropping the top tax rate on personal income by 20 percentage points creates a much more conducive environment for investment and entrepreneurship. And cutting the corporate tax rate in half is also a sure-fire recipe for improved investment and job creation. I’m also impressed that there’s been some progress on the spending side of the fiscal ledger. Netanyahu explained that the public sector had become a fat man resting on a thin man’s back. If Israel were to be successful, it would have to reverse the roles. The private sector would need to become the fat man, something that would be possible only with tax cuts and a trimming of public spending. …Government spending was capped for three years. The article doesn’t specify the years during which spending was capped, but the IMF data shows a de facto spending freeze between 2002 and 2005. And the same data, along with OECD data, shows that the burden of government spending has dropped by about 10 percentage points of GDP since that period of spending restraint early last decade. Here’s the big picture from the Fraser Institute’s Economic Freedom of the World. 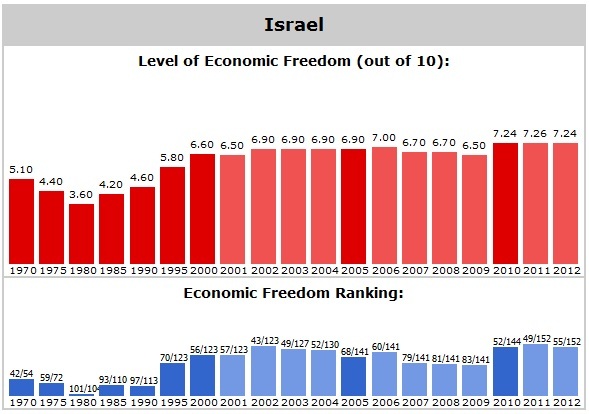 As you can see from the data on Israel, the nation moved dramatically in the right direction after 1980. And there’s also been an upward bump in recent years. Since I’m not an expert on Israeli economic policy, I don’t know the degree to which Netanyahu deserves a lot of credit or a little credit, but it’s good to see a country actually moving in the right direction. Let’s close by touching on two other points. First, there was one passage in the Forbes column that rubbed me the wrong way. Mr. Scott claimed that Netanyahu’s tax cuts worked and Reagan’s didn’t. Netanyahu might have succeeded where President Reagan failed. I think this is completely wrong. While it’s possible that the tax cuts in Israel has a bigger Laffer-Curve effect than the tax cuts in the United States, the IRS data clearly shows that Reagan’s lower tax rates led to more revenue from the rich. Second, the U.S. phased out economic aid to Israel last decade. I suspect that step helped encourage better economic policy since Israeli policy makers knew that American taxpayers no longer would subsidize statism. Maybe, just maybe, there’s a lesson there for other nations? The issue of whether tax cuts pay for themselves is a mute point without a timeframe. If we are talking about next year, then no. It is unlikely that tax cuts will pay for themselves in twelve months. People will not modify their behavior that quickly, especially when they perceive that the tax cuts might be short lived. Not to mention that some behavior is much longer term: “Should I get an advanced degree and gamble away my youth at a dubious startup? And will I become part of the resented rich once I make a significant contribution? Spending a significant portion of my vitality trying to hang on to earned wealth now claimed by the pitchforks? which makes the safety and fun of choosing to be an unknown surfer on the dole a little more appealing ?”. But, more importantly, in the short term, the higher growth brought upon by the lower rates will not have had enough time to compound yet, and thus provide tax revenue feedback. But in the longer term, a tax cut that leads the higher growth always wins. That is because growth is an exponent and tax is a fixed factor. The exponent always wins in the end, no matter how small. That is just simple arithmetic. But to the voter-lemming the only arithmetic that matters is the fact that even an indirect redistribution dollar today is worth five perpetually compounding growth dollars in the future.